A Junk-Foodaholic's Journey to a Healthy Lifestyle: "My Miracle" by Janet Pauly, R.N. "My Miracle" by Janet Pauly, R.N. I was diagnosed with Non-Hodgkin’s Lymphoma, cancer of the lymph system, on July 31, 1980 during surgery. Five days after surgery I was sent to M. D. Anderson hospital in Houston. This is the University of Texas cancer treatment center and is the largest of its kind in the world. There I was told that not only was my cancer widespread but that it was also incurable. After four years of treatment that included investigational drugs, my doctor told me that my disease was out of control and he had nothing more to offer me. I was sent home without another appointment but with his assurance that he would keep looking for something to help me. All this time everyone I knew had been praying for me. But now I had to face the fact that I might become another cancer fatality along with thousands of others. But God wasn't finished with me yet. Shortly after this I received a letter from a friend of mine in California who is also a nurse. Included in her letter was a sandwich bag that contained some green powder, a brochure and an audiotape. My friend said that she didn’t know if she believed in this stuff or not but that she was taking it and feeling good. Later she told me that she felt compelled to send the green powder to me. My orientation to medicine was conventional. I never took any kind of supplement and never went to health food stores. Green powder was definitely not something that interested me. I probably wouldn’t have tried it if the Lord hadn’t spoken to me and told me to listen to the tape my friend had sent…but that’s another story. On the tape I heard a woman tell about having breast cancer and what this green powder had done for her. Most stories that sound too good to be true are exactly that! I thought that this green powder must be some kind of quackery and fraud, although I wondered why the lady who was speaking would tell a story like this. I sent off for the green powder and began taking it only because I didn’t have anything else to do for myself. My largest tumor was under my left arm and was the size of a tennis ball. Four days after I started taking the green powder this tumor began to soften and was my first tumor to go completely away. Within a few months, all my tumors were gone. The Lord could have sent this green powder sooner, but He knew that as long as the doctors had anything to offer me I never would have tried it. I was taught in nursing school that we get all the nutrients we need in well-balanced meals. Our family ate healthfully: plenty of veggies, salads, legumes and whole grains. I should have been getting everything my body needed to stay healthy. The fact that my tumor began to soften after only four days on the green powder told me that there was something in the green powder, perhaps yet unidentified, that my immune system needed to begin to function effectively in my behalf. I believe that whatever this is may be difficult or impossible to get in our day-to-day diets for whatever reason. Bone marrow biopsy showed that I had suffered bone marrow depression due to all the radiation I’d been given and I was told this was permanent damage. All my blood components were low. After being on the green powder for four months I went back to the hospital and had a blood test and it was normal for the first time in four years. Subsequent bone marrow biopsy showed healthy bone marrow. My doctor and I both attributed my remission from cancer and my bone marrow recovery to the green powder. 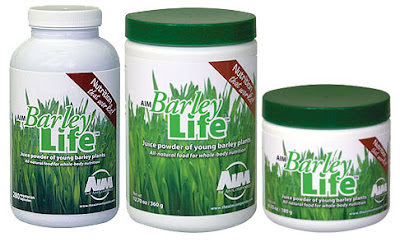 Today I take AIM BarleyLife™ which I consider to be the best green juice powder on the market. I continue to thank God every day for giving me thirty-two years of life after my cancer diagnosis. NOTE: Products of The AIM Companies™ have not been evaluated by the U.S. Food and Drug Administration (FDA) and are not intended to diagnose, treat, cure, or prevent any disease or illness. Results may vary per person. Understand that The AIM Companies™ does not have miracle products. It's the human body that is the real miracle. It just needs high-quality food to do its work. Labels: My Miracle by Janet Pauly, R.N.